The rough is, well, rough. Here's why. We know the rough is very difficult to play from right now, and we have tried to work the height of cut down as quickly as possible to alleviate that. 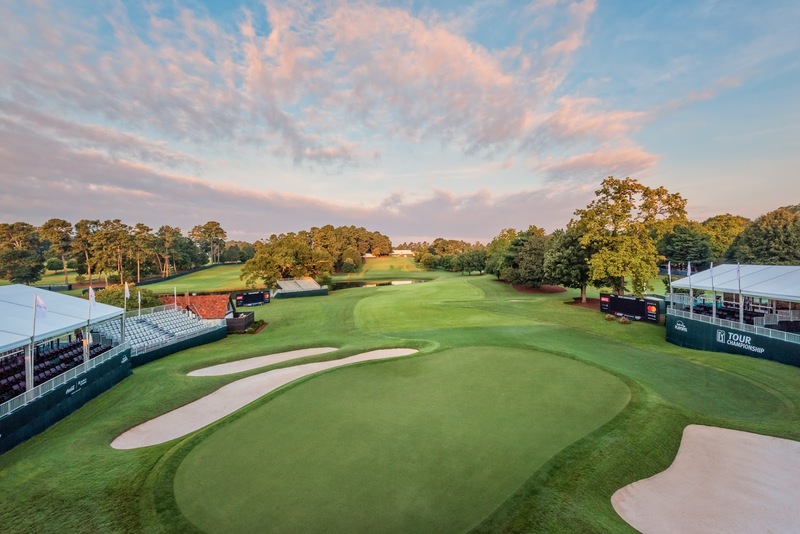 However, since temperatures were in the 90’s during the TOUR Championship, the rough grew throughout the tournament, and by week’s end we had rough over 4” tall. After discussion with the UGA Turf Team, we brought the height of cut down in ¼” stages, and are now at 2 ¼”. We will stay at 2 ¼” until we are dormant. I will explain this decision below. Plants, including grass, collect sunlight through their leaves, and then through photosynthesis and other processes, that sunlight is converted into carbohydrates. These carbohydrates are the energy plants use to grow and survive. They are stored in the plant roots. As we enter the autumn season, day length becomes shorter and shorter and light intensity decreases as the sun angle drops lower in the sky. With warm season turfgrasses such as bermudagrass and zoysiagrass, we try to create as much opportunity as we can to collect sunlight during the autumn months so the plant can store as many carbohydrates in the roots as possible before dormancy occurs. Those carbohydrates will be used in the spring when the plant begins to break dormancy. If the plant does not have enough carbohydrate reserves to allow the plant to begin growing in the spring, the plant dies. This is one of the common causes of "winterkill" in warm season turf. This situation is made more dangerous if we have a few "false starts" of dormancy break in the spring - when we get a warm spell that begins the process of breaking dormancy and then we get another frost that re-starts dormancy. If this occurs without enough carbohydrate reserves to break dormancy more than once, much of the turf will not be able to break dormancy. Our limiting issue with the rough right now is we have now removed 1 ¾” of leaf material from the bermudagrass at a time when all scientific research tells us we should be promoting as much leaf surface as possible. The amount of leaf material removed can best be seen by the loss of green color in the rough. If we don’t have leaves, the plant cannot gather sunlight and cannot produce carbohydrates reserves. To make this scenario worse, every time we mow – and especially when we scalp as we have done for three weeks – the plant uses carbohydrates to try to recover from the wounds created by mowing. It is a very bad cycle for us as we approach this winter. Hopefully, with the warmer than normal temperatures we are getting this fall, and especially this week, we will push out some new leaves and gather some extra sunlight. However, I feel we have pushed our mowing as far as we dare and I cannot in good conscious remove any more leaf material from our rough. 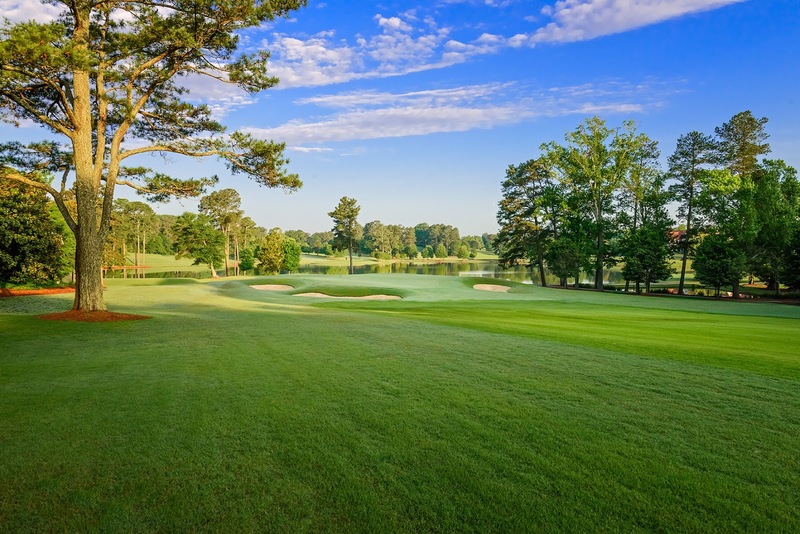 Once we have had a few frosts – hopefully after the East Lake Cup finishes on November 2 – the bermudagrass will lose its vigor and will become less difficult to play from. Unfortunately for our members and guests, this is the scenario we have with two televised fall tournaments. At least we don’t grow the rough to 3 ½” before the TOUR Championship anymore!